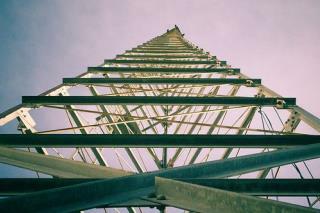 (Newser) – A radical group bent on stopping urban sprawl looks to be behind the toppling today of two radio towers northeast of Seattle, the Everett Herald reports. The Earth Liberation Front left a banner behind near the sprawling wreckage of KRKO-AM’s towers—one 349 feet tall—in Snohomish, reading “Wassup? Sno Cty. ELF.” In an email to the AP, a group spokesman said environmental concerns were behind the action. “We have to weigh our priorities, and the local ecosystem in Everett, along with the local residents, do not need additional sports news radio station towers that come at the expense of reduced property values and harmful radio waves,” reads the email from the ELF, which has claimed responsibility for dozens of attacks, mainly in the West, since the 1990s. timinator'em, why dontcha. thatll get'em. When was the last time an eco-terroist lynched a black man or burned a cross? I can only imagine a mind like lie berty man and jester999, wallowing in smugness, because as they see it, "my hate group is better than your hate group." dipshits indeed.